Sometime in the past I used to find myself inside horrible Electro/ new wave clubs. It was not a good experience, and I found it hard to appreciate anything in these evenings, as I don’t usually like this music and I don’t drink. Today I taste a taste that is a little different than what I used to in the short story I mentioned. Lust for Youth (Amanda Eriksson and Hannes Norrvide) releases its debut album, named ‘Solar Flare’, through Avant! Records, and within it are twelve tracks that echo these musical genres; but whereas the former musical genres relayed on clean sound and clear beats, Lust for Youth do something else. The upbeat music is being distorted by this duo up to the point where at certain moments of the beats and bright music only serve as an almost forgotten background to the sounds of audio decay and distortion. On those moments, the music of Lust for Youth becomes powerful and interesting, as the layers of distorted debris move and vibrate according to the hints of new wave music that are buried beneath them. It even reminds, in a way, of Alvin Lucier’s ‘I am sitting in a room’, as we hear the traces of the original sounds underneath the avalanche of noise and feedback. 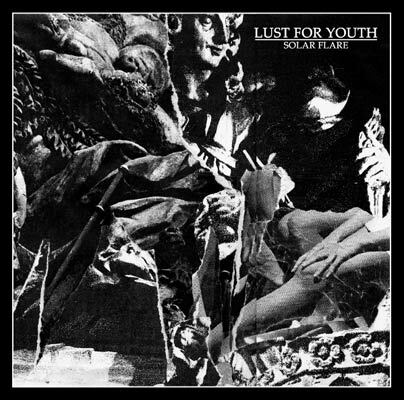 Lust for Youth plays a tragic joke on the listener. The music has a majestic aura to it, such as on the track ‘Ruins’, which should create a grandiose, dense atmosphere around the album, yet that same sonic declaration is constantly being pierced by sharp distortion that sometimes collapse the entire monumental track into a tragic, romantic version of it, while at other times it adds a more sleazy and dirty touch to the music, with distorted beats and muddy synth that enforce this notion. That is why ‘Solar Flare’ can be much more interesting and surprising than the music that is covered beneath the skin of its tracks. Check this album out. I am not sure about the youth, but there certainly is lust in here, and it is dirty and demanding.